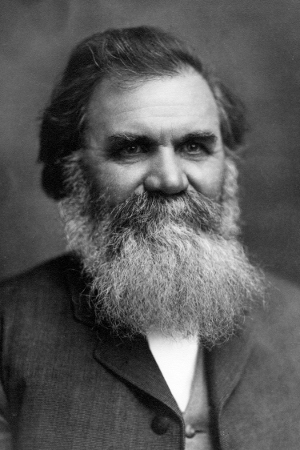 Daniel David Palmer, also known as DD Palmer, was the founder of Chiropractic. Palmer was born in Port Perry, near Toronto, Canada, and at the age of twenty moved to the United States with his family. Palmer held various jobs as a beekeeper, school teacher, and grocery store owner, and had an interest in the various health philosophies of his day, such as magnetic healing, osteopathy, and spiritualism. Palmer practiced magnetic healing beginning in the mid-1880s in Burlington and Davenport, Iowa. Palmer read medical journals of his time, and followed developments throughout the world regarding anatomy and physiology. While working as a magnetic healer, he decided to find the cause of all disease, and his work led to the foundation of chiropractic. His theories revolved around the concept that altered nerve flow was the cause of all disease, and that misaligned spinal vertebrae had an effect on the nerve flow. He postulated that restoring these vertebra to their proper alignment would restore health. Palmer founded a school based on his work that would become the Palmer School of Chiropractic (PSC) (now Palmer Chiropractic College) in 1897. By 1902 the school had graduated fifteen chiropractors. At that point, Palmer was prosecuted under the new medical arts law in Iowa for practicing medicine without a license, and spent part of a six-month sentence in jail as a result. Shortly after being prosecuted, he sold the school of chiropractic to his son, B.J. Palmer. As soon as the sale of the school was finalized, DD Palmer went the the west coast where he helped to found chiropractic schools in Oklahoma, California and Oregon. The relationship with his son was tenuous and often bitter, especially after the sale of his school. Their subsequent disagreements for the direction of the emerging field of chiropractic were evident in Palmer's writings. He would never regain the control of Palmer College (the Fountainhead of Chiropractic). Although he was the "Founder of Chiropractic" and was affectionately called "Old Dad Chiro", his son BJ became known as the "Developer of Chiropractic". Palmer opened his office of magnetic healing in Davenport, Iowa in 1886. Nine years later, on September 18, 1895, he gave the first chiropractic adjustment to a deaf janitor, Harvey Lillard. Palmer and Lillard subsequently gave different accounts of this first experiment with spinal manipulation. According to Palmer, Lillard had told him that, while working in a cramped area seventeen years earlier, he had felt a "pop" in his back, and had since been virtually deaf. Palmer found a sore lump that indicated spinal misalignment; he corrected the misalignment, after which Lillard could then "hear the wheels of the horse-drawn carts" in the street below. However, Lillard's daughter, Valdeenia Lillard Simons, said that her father told her that he was joking with a friend in the hall outside Palmer's office when Palmer joined them. As Lillard reached the punchline, Palmer, laughing heartily, slapped Lillard on the back with the heavy book he had been reading. A few days later, Lillard's hearing seemed better, and Palmer decided to explore manipulation as an expansion of his magnetic healing practice. Simons said "the compact was that if they can make [something of] it, then they both would share. But, it didn't happen." After the event, Palmer said: "I had a case of heart trouble which was not improving. I examined the spine and found a displaced vertebra pressing against the nerves which innervate the heart. I adjusted the vertebra and gave immediate relief -- nothing 'accidental' or 'crude' about this. Then I began to reason if two diseases, so dissimilar as deafness and heart trouble, came from impingement, a pressure on nerves, were not other disease due to a similar cause? Thus the science (knowledge) and art (adjusting) of Chiropractic were formed at that time." Palmer asked a friend, the Reverend Samuel Weed, to help him name his discovery; he suggested combining the words cheiros and praktikos (meaning 'done by hand'). In 1896, Palmer added a school to his magnetic healing infirmary and began to teach others the new "chiropractic"; it would become the Palmer School (now College) of Chiropractic. Among the first graduates were his son BJ Palmer, Solon Langworthy, John Howard, and Shegataro Morikubo. Langworthy moved to Cedar Rapids, Iowa and opened in 1903, the American School of Chiropractic & Nature Cure, combining chiropractic with osteopathy and other natural cures from the newly developing field of naturapathy. DD Palmer, who was not interested in mixing chiropractic with other cures, refused the offer of a partnership. A subluxated vertebra is the cause of 95 percent of all diseases. The other five percent is caused by displaced joints other than those of the vertebral column."